The SILVA Instruments were fitted on Rosie in New Zealand in 2004. 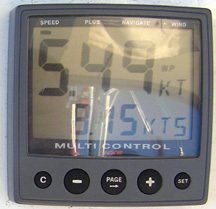 We purchased a multi display, a wind instrument and a GPS unit complete with speed/temp, depth and wind transducers. The SILVA instruments have a central server to which everything is connected giving much more functionality than if they were stand alone instruments. The system has the added advantage that if the server were to break, the transducers can be wired directly into the instruments and still function in a limited capacity, I do like redundancy. The full functionality is described in detail in the manuals which are located in the stbd salon cabinet, I will just describe our installation. As well as the transducers and instruments, the NavStation Garmin GPS and a serial cable for the computer are connected to the server. The Trimble GPS is connected into the back of the SILVA GPS Display. 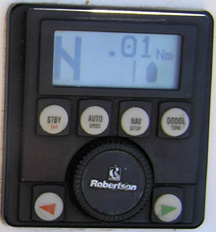 The NMEA outut from the server is connected to the Robertson Autopilot. If a route is entered onto the Garmin GPS the cockpit SILVA GPS head will display information to navigate the route, also the autopilot can automatically steer this course. 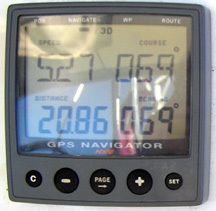 If a route is entered in Navigation software on the PC the cockpit SILVA GPS head will display information to navigate the route, also the autopilot can automatically steer this course. A route may be planned on a PC and uploaded to the Silva system giving full waypoint control to the SILVA cockpit GPS control head. A route may be entered directly on the cockpit SILVA GPS head. If the autopilot, Bob, is steering the boat to a predefined route, he will not change course when a waypoint is reached without someone first acknowledging the change on the AP300 screen. 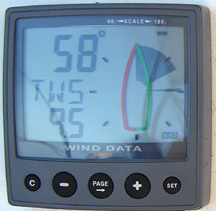 Since the computer is connected to the network all the NMEA data is visible in most charting packages, i.e. depth, speed, wind conditions etc. This negates the need for a Mulit unit at the NavStation as the computer acts as one. There are many many more combinations but this is our "usual:"